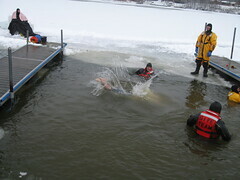 Last year I did a Polar Plunge to raise money for the Special Olympics – Read about it at Taking The Polar Plunge. I’m doing it again this year and have much loftier goals this year. Last year I raised $725.00 and this year I want to raise $1000.00 and inspire others to do the same. At the time of this writing, I’ve raised $500 personally and have inspired 2 others to do the dive with me. First, why in the world would I do this in the first place? You may or may not know that I have a daughter with special needs. Her name is Maura. She’s 6 years old and while we don’t have a name for what she has the symptoms are that she has global delays and a seizure disorder. Despite this, she is one of the most passionate people that I know and approaches everything with wonder and excitement. She loves sports, playing with other kids and all kinds of activities. She’s amazing and an inspiration to me all the time. She is not currently in Special Olympics but she will be soon so I’m supporting them now. I know that she will approach it like she does everything else with wonder and excitement. If you would rather just donate to my plunge, you can do so at Josh Holmes’ Polar Plunge Fundraising Page. Either way, I thank you for your support! If you are not able to support the Special Olympics of Michigan right now, please consider doing so in the future. You can see a lot great ways to get involved at http://somi.org/page.php?contentID=1233.